As for inspiration, both for the name and the pattern, it seems Shannon spied a gorgeous old lady wearing a knitted hat like this one in the post office. She just had to make her own crocheted version, incorporating such distinguishing features as the little tail on top and the glorious puff-stitch. Ch 4. Sc in second chain from hook and in each chain to end. In last chain, do 4 sc. Ch 1, 2 sc in each sc. Join, ch 1. 2 sc in first sc, 1 sc in next sc. Repeat to end*. Join, ch 1. 2 sc in first sc, 1 sc in next 2 sc. * Join, ch 1. 2 sc in first sc, 1 sc in next 3 sc. * Join, ch 1. Continue in this manner, increasing the number of sc by one every round, until the circle is big enough to cover the top of your head. Most people find that six inches is a good size for hat crowns. 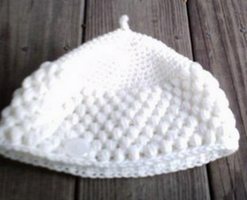 Now, do puff stitch in the round until the hat is as long as you would like. 1. Yo, insert hk in next st, yo, draw up 1/2″ long lp, (yo, insert hk in same st, yo, draw up 1/2″ long lp) 2 times, yo draw through first 7 lps on hk, ch 1, skip one sc. Repeat to end. 2.Do puff stitches in the ch 1 spaces between puffs on the second round and subsequent rounds.